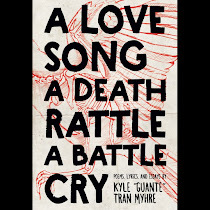 This February, Button Poetry will be re-releasing my debut book, A Love Song, A Death Rattle, A Battle Cry. It's got a new cover (by designer Nikki Clark), but it's the same book that's been out for a year now. The book was technically self-published, and Button handled the online orders and helped promote it. As we've gone through a few runs now, we figured we may as well "make it official" and actually publish the book through them. I'm hoping this re-release puts the book in more people's hands. If you already got one, thank you! If you didn't, you can order it here. You can also read the full first chapter, "Ten Things Everyone Should Know About Spoken Word and Slam Poetry," here. It's always weird seeing my book next to other poetry books (Button has also published books by Danez Smith, Melissa Lozada-Oliva, Rudy Francisco, and many others; mine will be joining a 2018 slate that includes Neil Hilborn, Rachel Wiley, and Jared Paul); I don't say that to be faux-midwest humble; I think the book functions pretty differently from most poetry books, so I'm extra grateful to Button for being so supportive of its weird vision. I'm currently working on the next one too. 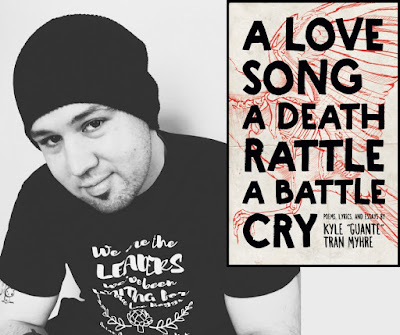 One part mixtape, one part disorientation guide, and one part career retrospective, this book brings together spoken word poems, song lyrics, and essays from the past decade of Guante’s work. From the exploration of toxic masculinity in "Ten Responses to the Phrase 'Man Up'," to the throwback humanist Hip Hop of "Matches," to a one-act play on the racial and cultural politics of Eminem, "A Love Song, A Death Rattle, A Battle Cry" is a practitioners eye-view of the intersections of Hip Hop, poetry, and social justice. "It’s riveting, it’s blunt, and trust me, you will be smarter when you finish this book than when you started." "A poignant critique of power, privilege, allyship, identity and more, A Love Song, A Death Rattle, A Battle Cry grounds the abstract concepts of social justice in heart wrenching narrative poetry and brilliantly insightful raps. Generously loaded with commentary on his structure, process and pedagogy, this collection is arsenal, consider yourself weaponized." 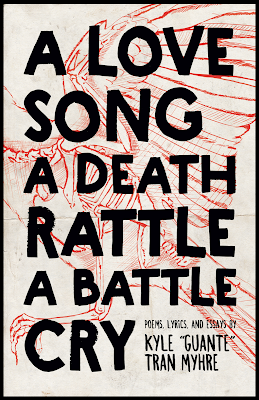 "A Love Song, A Death Rattle, A Battle Cry is more than just a book; it is an experience. To say every poem was welcoming would be a lie. To say it gave me hope would be another lie. It gave me fight. It gave me a set of nails, a hammer painted pink, and a dare to build something I always thought was impossible. Go! Get your hands dirty." Come to the book re-launch event too! Sunday, February 25, at Icehouse in MPLS.